I came across this very informative grave in the churchyard of All Hallows, Woolbeding. Behind all that very useful information - I wish all graves included such detail - there is a sad story. Trevor Aston's father had a mental breakdown in 1929 and the family moved to Sussex where his mother got work in an orphanage in Woolbeding. 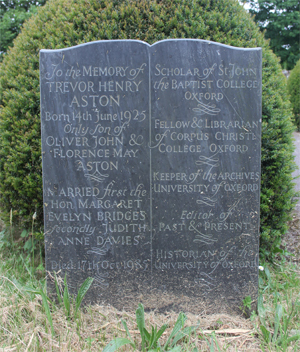 Trevor was clever enough to get a place at Oxford and after graduating in 1949 with a first in modern history he became a tutor at Corpus Christi and he was to remain at Oxford for the remainder of his life. He was very active in the university especially in the library as his gravestone indicates but he suffered from manic behaviour with its highs and lows. His extreme behaviour had ended his first marriage and was in the process of finishing his second, he was an alcoholic, had alienated his colleagues and he was about to lose his job when he took an overdose of drugs on the 17th October 1985.